It took Web entrepreneur and photography geek Derek Powazek about 24 hours to figure out a use for the incredibly strange photos of Sydney that he was seeing on Flickr. The Australian city was being blanketed by a freak dust storm that was dumping 82 tons of fine red earth from thousands of miles away every hour. Awed Sydneysiders were posting images of eerie rust-colored landmarks and scarlet skylines by the hundreds. "I wanted to put those photos where they deserved to be," Powazek says. "In print." Not coincidentally, Powazek had been working with Hewlett-Packard on the development of MagCloud, a publish-on-demand service that lets anyone become his or her own print magnate. Potential publishers e-mail the site any number of documents to be printed on standard, letter-size magazine stock. MagCloud takes care of the rest  binding the pages, selling the finished magazine on its website and delivering each order. For this HP charges about 20 cents per page; the publisher of the magazine can add a markup to that. So far the site has proved popular with religious organizations, artists and other groups that have a dedicated rather than a mass following. (Mormon Artist is one such title.) What Powazek proved is that MagCloud could also be a breakthrough for news. Powazek e-mailed about 70 Australian photographers to tell them he was assembling a magazine and ask if they would like to be involved. They weren't offered any compensation  and only one turned him down. Powazek laid the photos out using Adobe InDesign, put together an introduction and sent it off to MagCloud. By the dawn of Sept. 25, barely 48 hours after the dust storm, Strange Light: Photos from the Great Australian Dust Storm was ready to roll off the presses. Why would a Web guy like Powazek slave over an old-fashioned paper product? "Magazines are my happy place," he says. "I think print and the Internet complement each other more than people realize." Certainly, there's something about once-in-a-lifetime occurrences that cry out for print. It's as if holding something tangible is a more satisfying way to process and mark big events than bookmarking a page. When Michael Jackson died on June 25, TIME mobilized its hundreds of employees  in journalism, ad sales, production and distribution  around the globe. We all worked the phones and keyboards until late into the night and weekend. By June 29, there was a tribute magazine on newsstands across America. It sold north of 500,000 copies. Is Strange Light a more efficient, quasi-new-media version of that process? Not yet. 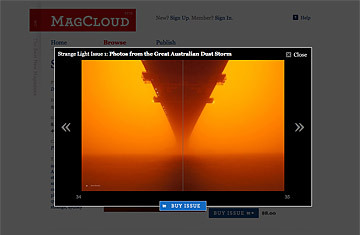 The magazine is available for sale online, but MagCloud doesn't distribute to Australia, where it's reasonable to assume interest will be highest. (Powazek offered to send it to anyone who wanted it, and one Australian took a bulk order for local distribution.) Delivery from MagCloud can take up to two weeks, which is like baking fresh bread and shelving it. HP has plans to shorten the lead time, but it's at the mercy of the postal service. Meanwhile, newsstands remain the point of purchase for most commemorative issues. Plus, although Powazek and the photographers aren't making any money off Strange Light, it costs eight bucks. (TIME's Jackson issue was $6.) Publishing on demand and MagCloud are clearly not going to solve all the woes that ail media. But Powazek looks like he's having a lot of fun trying.